My entire life is dedicated to helping autistics to feel safe, empowered and free to be themselves. To that end, I’m always reading and researching and looking for the newest programs and tools that can help. I am autistic as is my oldest son Cameron so this is near and dear to my heart. Recently Colgate reached out to me, asking if I’d be interested in taking a look at something new that they’re involved in. 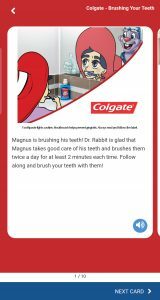 Colgate partnered with MagnusCards™, an innovative mobile app that empowers people living with cognitive special needs, such as autism, to independently manage daily skills such as tooth brushing. So, before you continue, be aware that this is indeed a paid, sponsored post by the good folks at Colgate but also to be aware that there is no obligation on my part to be anything but honest. In fact, that’s exactly what they’ve asked of me… to review the product and “post honest and truthful opinions.” So that’s exactly what I’m going to do. What is the MagnusCards™ app? This is how their website describes it: “MagnusCards are digital how-to guides for everyday living.” That’s an oversimplification. This app is really a visual and audio, step by step guide on how to do virtually any routine task from household chores, travel and personal care such as brushing your teeth. There are currently 12 categories such as food, safety and more, each contains decks of cards. Each card being an individual step in completing the routine. But the app goes even further. MagnusCards™ offers rewards for completing those tasks and then ranks you in comparison to others that use the app. The more you use the app, the higher you rank. The biggest feature though, in my opinion, is that there are pre-made decks that you can download to get started with, such as several decks from Colgate. There is in fact more pre-made decks now than there was when I first downloaded the app a week ago, so I’m sure there will be even more added as time goes on. There is also the ability to create your own decks, including pictures and audio. This means that there’s virtually no limit to the ways in which you can use this app. 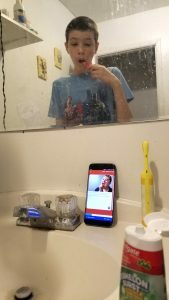 Cameron (my son, 12 years old with autism) and I looked through the app a little bit together. We looked through some of the preset tasks and headed into the Care section. We hit the “Download More Cards” button and found all of the decks from Colgate. Cameron looked at me said “aww… do I have to do this?” Kids! Am I right? 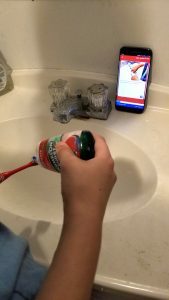 My son went into the bathroom, set the phone up against the back of the sink, under our dirty mirror, loaded up the Colgate – Brushing Your Teeth deck and followed the cards. It was so simple. It was as if he had done it a thousand times before. You know what?? It worked! I mean, he’s always brushed his teeth when I ask him to but he’s never liked it and more so, would rush through it. I swear some days he’d walk into the bathroom and right back out again claiming he’s done brushing. But using this app, following the cards step by step, he did a thorough job. I’m sure it will go faster over time as he learns the cards but still, he’ll do a much better job than without. He completed all the steps and pressed on the “I’m Finished All The Steps!” button and was pleasantly surprised to find that he earned points for a task well done. After Cameron finished brushing his teeth and earning his points, I asked him what his honest opinion of the app was. He sort of shrugged his shoulders, as kids will do, and said “It’s ok, I guess.” Kids! I’m right. I know I’m right. Pressing further, I asked if he thought this helps him and if he thinks it would help other children. He said that it definitely does make him brush better. Having the cards to follow really made him do a better job than when he does it on his own. I’m in total agreement with him. Yes, in my house I have alarms set up on our phones that tell us when to do certain tasks and that includes brushing our teeth. I give him full points for this and if there was one feature that I’d like to see in this app that isn’t there, it’s a reminder setting. Perhaps even if just one of the default tasks was exactly that… helping you to setup reminders to do daily tasks. That would be enough. Aside from that though, this app really checks all the boxes. Doing banking, taking the bus, going shopping… all of that stuff is in there with pre-made decks. The ability to make your own decks is incredible not just for tasks that you can’t find to download but also for that personal touch. Being your child, especially if they are autistic, no one would know how to explain things to them better than you. I’ll be honest, I’ve seen other apps that do help autistic children with communication, and routines and more. In comparison, MagnusCards™, on the surface, seems quite simplistic, like there’s not really a lot to it. The more that Cameron and I used it though, the more that started to feel like an advantage rather than a disadvantage. This app does exactly what it sets out to do and it does it with surprising versatility when you really break it down. Being able to create your own decks quickly and easily is a very powerful tool. Having pre-made decks from some very big sources like Colgate is also a huge factor. None of those other apps I’ve reviewed have that. The best part though is that it’s free. The decks are free. It’s a really tiny app. Takes up no space, uses practically zero battery power. And it’s very easy to use. So let’s say you do go ahead and try it and it doesn’t work for your family (and let’s face it, no one thing works for every single family), then you uninstall and try something else. Right? There’s no reason to not try it unless you already have a system that is working in which case, I don’t think anyone would fault you for sticking with it. Colgate is sponsoring me on this and I have promised to share some of that with Cameron as he helped me review it. Regardless of that, I absolutely would and will recommend MagnusCards™ to people I know. I really think people should at least give it a try. Watching Cameron use it a few times now, I have to say that for as simple as it is, it works. Check out the Colgate MagnusCards™ at http://colgate.magnuscards.com and let me know what you think! I think 2016 is most notable for how many celebrities passed away. Not just celebrities but like, legendary celebrities that revolutionized what ever it was they did. There’s also the whole election thing, but what ever… moving on. In the autism community, something else died. It faded away. Only, most people never really noticed. Autism blogs. I was looking through the list of autism blogs that I have along the side bar of this very blog and noticed that not one of them has a post in 2016. Some stopped updating as far back as 2014. Most in 2015. In 2016… no signs of life. All vital signs… flat lined. I’m not really one to talk, I’ll admit it. My last post was in April, this is very near the end of December now. So what’s the deal? Well, for me, I got busy. 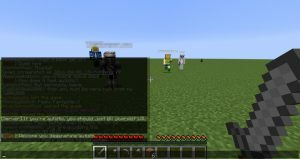 I started Autcraft and it literally exploded in popularity, not just within the autism community but also in the media and even with researchers. What happened to autism blogs in general? Why did they fade away? Why have parents stopped writing? In the beginning social media drove traffic to our blogs. It was great. You start a fan page or a twitter account, post links there to your blog posts and people start flooding in. It was the easiest thing in the world. But social media evolved and the people did too. People didn’t want to go to social media just to go somewhere else. People wanted to read what you had to say right there, where they are, without having to go anywhere else. That’s basically what social media sites are designed to do… keep you there, not send you elsewhere. And it worked. Autism bloggers found that they had unlimited space to write what they wanted right on Facebook, or Google+ or Medium… not so much Twitter. People commented there. They shared there. They liked there. And the more they did, the more other people saw it. None of that happened when the person went to a blog to interact with you. As much as autism parents don’t have time to read long articles anymore, they also don’t have time to write them. It gets even worse when you write them and then go to other people’s blogs to read them too. 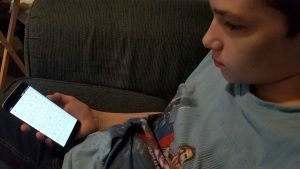 Your whole day ends up being consumed with blogs when, as we autism parents know, there’s very little “free time” as it is. So those autism bloggers who loaded up social media sites to see what friends and others are doing, they would just update their life there. Where those people are. There was no point in going to some other website, signing in, writing a post, proof reading, spell checking, styling, finding images and styling it all just to go back to their social media sites to share the link with people who don’t want to have to go there just to read it. You’re better off just skipping the fancy stuff and putting it right on your social media page. Less time for you and the reader that way. Social media is free. Well, sudo free. You get ads and stuff which pays for it but you personally do not have to pay anything for it. A blog on the other hand, you do. If you want a custom domain name, if you want a custom look and feel, if you want to do give-aways… chances are you have to pay for all that. There are ways around some of those things but it takes work… which also equates to value. Money. On Facebook though, you don’t have any of that. You just type what you want to say, hit the button and you’re done. Hassle free. No domain, no files, no plugins, no themes… if time is money, then just putting your thoughts into a Facebook post instead of a blog is priceless. I am a little sad that autism blogs don’t seem to be a thing any more. For some reason, it was just easier to find other autism parents that I could relate to when I would go from blog to blog with their shared links and read about their experiences and feel like I knew them a little bit. That’s tougher to do in social media when your only real interaction with someone is a shared comment on someone else’s thoughts on the latest television show. 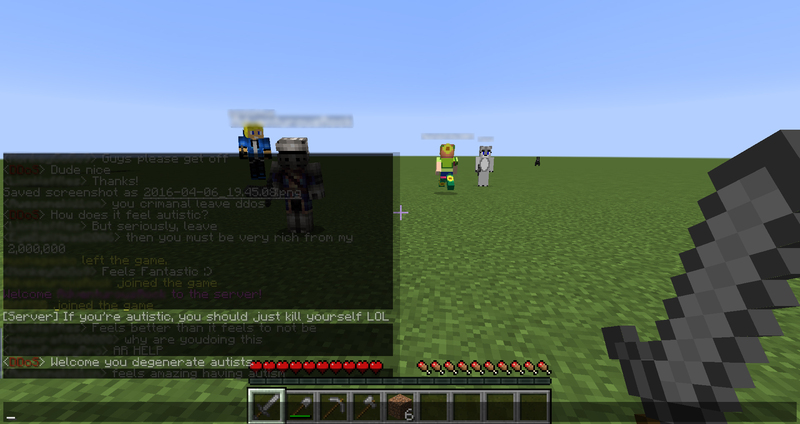 Also there’s the whole friend request or “follow” thing. I think most people feel a lot less awkward about just having readers than they do in having people be on a friend list. Many autism parents do still try to help each other out though by sharing each other’s Facebook fan page updates or giving shout outs and things but it’s just not the same. Perhaps I’m just nostalgic. The autism blog era may be mostly behind us but it’s not completely. There are still some autism blogs out there and some new ones starting up all the time. Plus, there are still people doing actual writing on the subject and about their families, they’re just harder to find now but they are out there. Also, those people who do friend some other people they find on social media turn out to be very good friends, even meeting each other in real life after a while. That doesn’t normally happen with readers on a blog. So there’s that. I guess what I’m trying to say is… RIP Autism Blogs. You will be missed. But there’s still lots of good stuff for us in 2017. We just have to adapt and make the best of what we have. Dad, what happens when you die? My cat, Prince, my friend for 17 years, is dying. He hasn’t eaten in over a month. He’s very skinny, moving slowly. The kind of thing that even my children can’t miss. Which lead to a talk about preparing for Prince, the cat that is the combined age of both of my children put together, to die soon. Often while putting my boys to bed, they’ll ask me a question. It’s usually a science question. I figure the reasons being that they truly are interested in science combined with the fact that they know I’ll sit and talk about it rather than tell them to just go to sleep. Tonight, they asked me what happens when a person dies. I explained to them that some people believe that if we are good enough, we go to heaven after we die and we see friends and family that have died before us. Some other people believe that we simply… stop, like going to sleep and never waking up but never dreaming either, just no longer existing. This is heavy stuff for a 10 and 7 year old. Then I said that I believe it’s somewhere in the middle because of what I know about science. I told them that scientists have looked into our molecules, into our atoms and found the very same elements from the big bang… the very start of our universe. The same things that are found in stars and galaxies billions of years ago, billions of light years away, are found right here, in us. Everything in the universe is connected and can be traced back to the big bang… when time and space, as we know it, began. Again, pretty heavy stuff for a 10 and 7 year old. They just stared at me. Yup, heavy stuff for a 10 and 7 year old. I turned off the light and left the room. They did not sleep. For two hours, while I worked, I heard them talking about it. I was supposed to go in and tell them to stop. I was supposed to tell them to go to sleep. So the Sesame Street #SeeTheAmazing autism program was launched and shared and talked about like mad and of course, torn to shreds and judged and attacked. Why? Well, I could go into the details but honestly, the details don’t really matter. This has happened with every program and story ever created and will continue to happen. No one autism story takes every single perspective into account. They just can’t. Many of the perspectives conflict, making it very difficult to include together and there are just so many that it’s nearly impossible to remember to include them all. Personally, I’m attacked every single time I talk about how great a person with autism can be, because I’m not talking about how disabling autism can be. Then I write about how disabling autism can be and I’m attacked because I’m not making autism sound like the best gift ever. This happens every single time. It really doesn’t matter to whom you are talking or whom you’re talking about or what position you take or how much good you do. None of that matters. You will be hated for it. 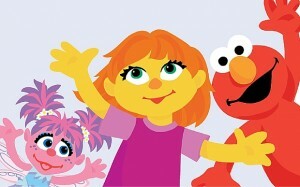 Sesame Street’s program isn’t perfect because I didn’t create it. Even if I did, it would only be perfect for me. Not for everyone else. Lots of people would hate it. This is why we don’t only have one company doing one program or one person telling one story. Parents will reach other parents. Autistics will reach other autistics. Somewhere in the middle of it all, we’ll all reach each other. But not everyone will like it. 1. Don’t attack each other. Constructive criticism is educational. Hateful attacks create closed minds. Show people how your story is different. I’m sure they’d even appreciate that. Just don’t attack them because their story doesn’t align with yours. 2. Don’t take the criticism personally. Some people are not going to like what you say because it’s not what they wanted you to say. So long as you have something to say, there will always be people who will want you to say what they want said. It’s personal for them, it’s not personal against you. They’re allowed to wish you said what they wanted to hear. If you are doing good work and making a positive impact and changing lives, keep going. Let other people worry about their own programs and their own stories. There’s more than enough room for everyone and there is more than enough stories. That’s where real autism understanding and acceptance comes from.